During one of our recent walks through Chagrin Falls (which are, honestly, usually nothing more than an excuse to get ice cream at Jeni’s), we stopped at the recently opened Lemon Falls Cafe and grabbed some grub to go. Had we had more time (and maybe not a toddler in tow), we would have sat in the dining area, which is small but quaint, with large windows all around, and just seemed like a nice place to sit and enjoy a sandwich and a cup of coffee. Assuming, of course, that you drink coffee – I don’t, but I do enjoy the smell. They also have a nice breakfast menu, which, after this trip, we’re certainly going to have to try sometime. There’s a deli case displaying a sample of prepared goodies, including meatloaf and a wide variety of salad dishes. In another corner are a few shelves with various gourmet items, such as handmade flatbreads, pasta sauces, and caramels. The drink options include Saratoga and San Pellegrino waters (we are in Chagrin Falls, after all), some kind of juice with floating chia seeds, and some fancy fruit sodas – quite an interesting mix! We brought home a couple of sandwiches, a cup of soup, and a bit of the bean and corn salad for C. One of the sandwiches combined a large chunk of grilled turkey meatloaf with barbecue sauce, caramelized onions, and provolone cheese, in between a couple slices of thick, buttered and grilled bread. Very good and very filling. There was a hint of horseradish (in the BBQ sauce?) that added a little zing to the heaviness of the meatloaf. 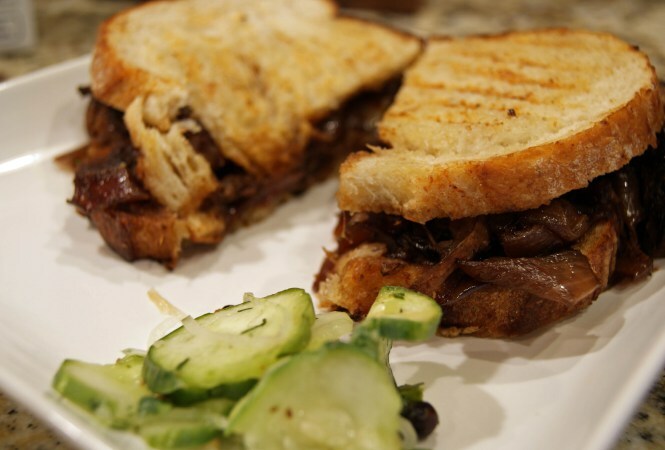 The second sandwich, which seems to be among their most popular, consisted of delightfully tender short rib meat, Gruyère, and more caramelized onions, again slathered on the same warm and buttery bread. It was easy to see why this is a top seller! 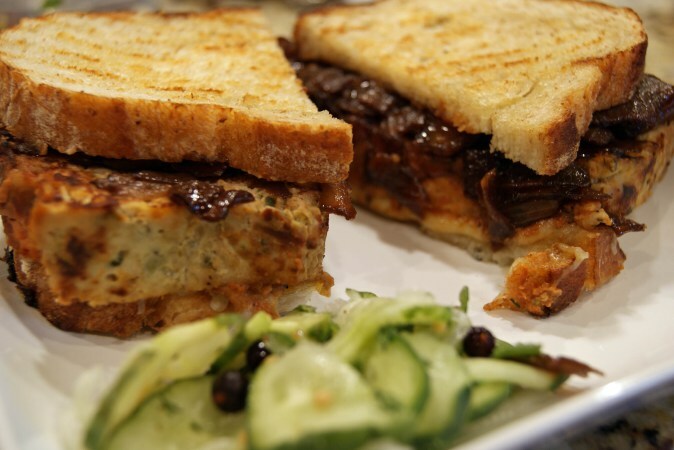 Both sandwiches also came with pickles so fresh that I’d almost still call them cucumbers – sweet, crunchy, and just lightly pickled; nothing at all like the slices of green mush that you’d find in a jar. Lemon Falls is a great new addition to the community, and highly recommended for anyone looking for a quick, light bite to eat.